I am decorating for Fall, and making the most of the Autumn Harvest Fairs and antique bazaars. Here are a few of the things I have found. An American transferware creamer, I think from the late 1800s. I love the details of the flowers and the bright blue on white. This would be so perfect as a vase with just a few buds in it. I am not sure if this was a sap bucket or had some other use, but it has the greatest patina. Take a look at it with dried hydrangeas. Hydrangea dry so beautifully. Just forget to add water, which is how I usually do it. A great French flea market find. Perfect for jewelry or to hold my little papers. Au Fidele Berger is a a chocolate house in France. I imagine this was filled with Macaroons or bonbons. C'est delicieux! 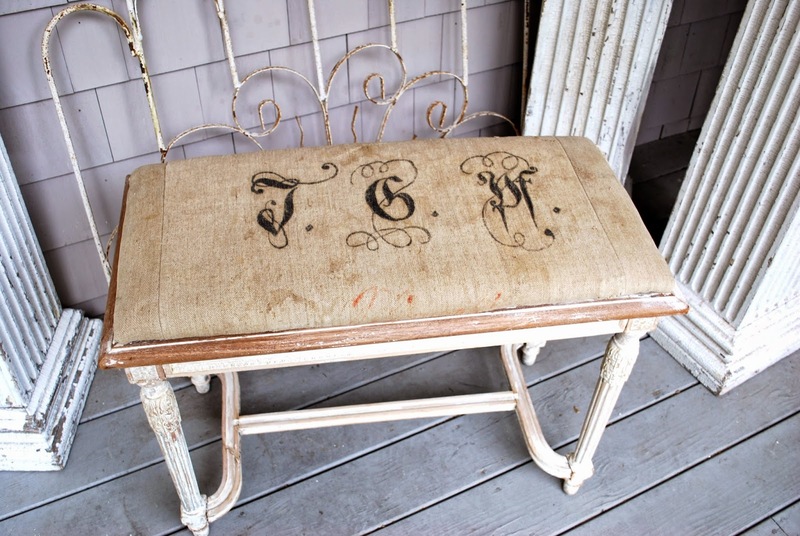 This bench was a perfect flea market find from years past. It had some very heavy, shiny paint on it, so I stripped it down but left the last layer, which created a perfect patina. Then I covered it in the back of an antique German grain sack. Voila! A beautiful Swedish Gustavian or antique French look, from an American bench and a German sack. How multi-cultural. This vintage German grain sack was made for the 1962 World's Fair in Seattle, Washington. It is now in my shop in New York. It really travelled the globe. Since it was never actually used, it is in pristine condition. It has a super rare royal blue and white stripe, with the snowflake motif on top. I mounted it on a stretcher so it can be hung as a piece of art on the wall. I am headed outside to enjoy the cool, dry weather, and "shoot some loot" from some more of my flea market finds. And I will start decorating with Autumn colors today. I can't wait to show you.